Vermont's largest and perhaps most cosmopolitan city, Burlington beckons with the perfect blend of old New England charm, arts, culture and nature. 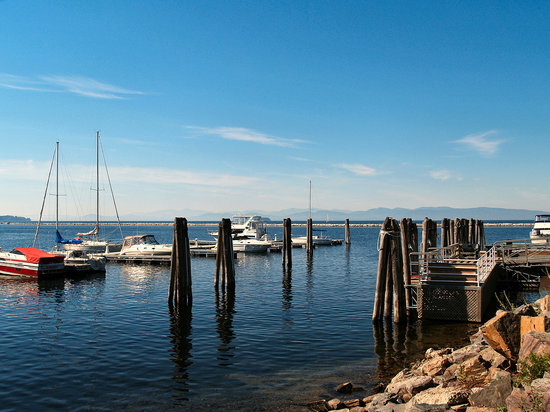 Located on the shores of Lake Champlain, between the Adirondack and Green Mountains, Burlington is one of those places you can't help but fall in love with. During the spring and summer, the streets come alive with festivals and outdoor concerts. The picnic benches, playground and bike paths of Leddy Park are filled with warm weather revelers, and opportunities to swim, fish or just kick back on the beach abound. In the fall, the Burlington Bike Path is bustling with leaf peepers who come to view the vibrant autumn colors. In winter, lace up your ice skates and head to the Paquette Arena or grab your skis and head to any of the nearby resorts. Church Street Marketplace, with its early 1900s architecture, great restaurants, live entertainment, one-of-a-kind shops and well-known stores, is the focal point of the downtown area. Anytime of the year is a good time for chocolate. Be sure to stop by Lake Champlain Chocolates for a tour and taste.